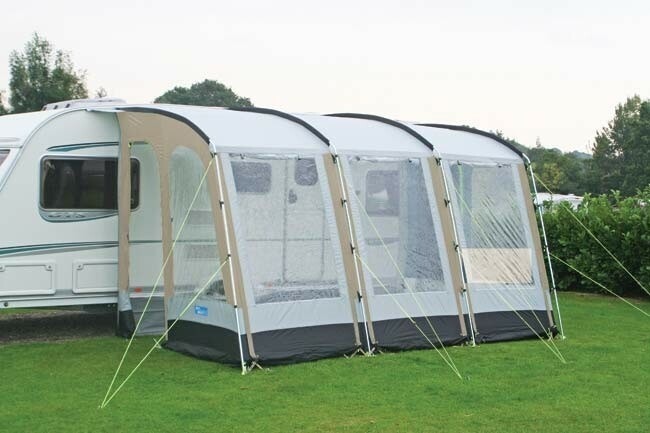 Although this style of lightweight caravan awning has been around for some time, the Kampa Rally's was the first range that was produced with steel upright poles. 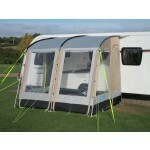 This gives the Kampa Rally 390 Awning incredible additional stability and construction strength. 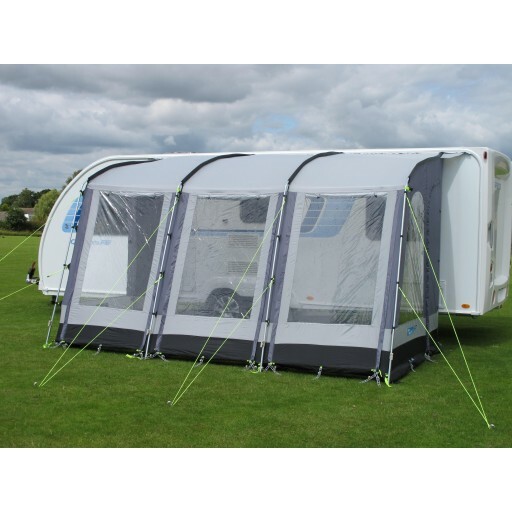 As with most other models, the Kampa Rally 390 will fit caravans with 235-250cm rail height but the steel poles allow for better internal head height. 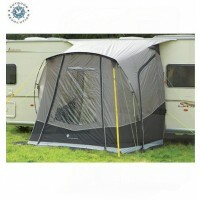 As the name suggests the awning is 390cm (3.9m) across and 2.5m deep. 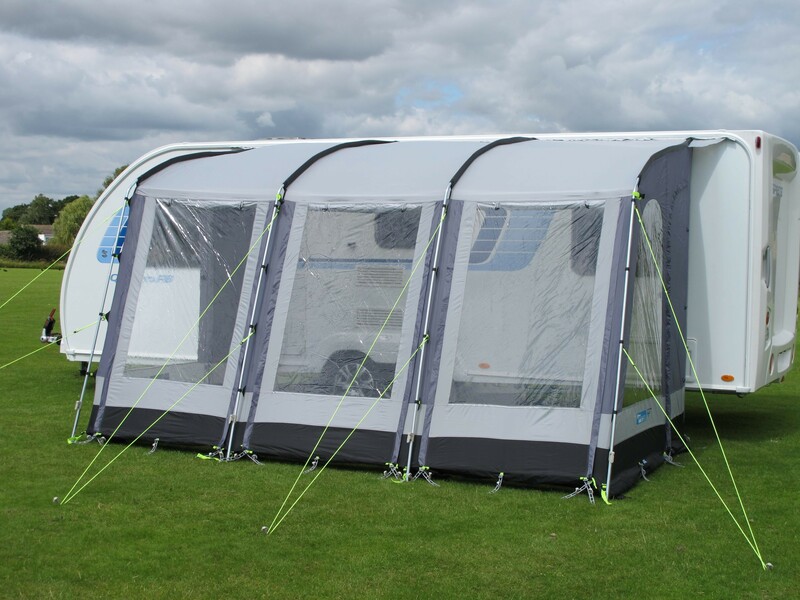 The flysheet is top grade 150D Weathershield Heavy Duty fabric with 4000mm F/R, fully taped seams and is also UV protective. 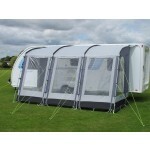 The three front panels can be completely rolled-up or propped open to form a sun canopy (no porch poles supplied). The Crystal Clear windows come with drop down blinds. 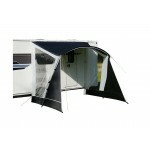 The two side 'J' doors also features no-see-um mesh panels. Other features include rear pad (Stanetta has plenty) set to help seal against the caravan, 150D Weathershield mudwall all around the base, luminous guylines, valaise carry bag, adjustable front legs which makes levelling out on uneven ground a formality. 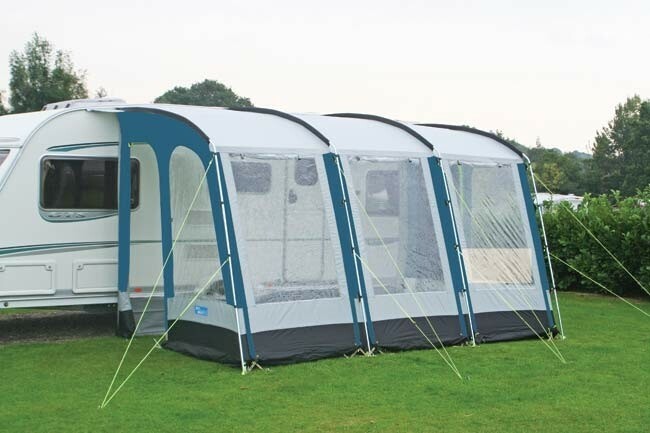 Porch poles, rear upright poles, storm tie down kits, monsoon poles, Velcro-in fitted groundsheet, inner tent and integrated windbreaks all available as optional extras. 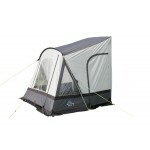 Kampa Rally 390 Caravan Porch Awning.